Wildfire areas in California under the new code mandate all structures use class A fireproof sidings, roofing, Tempered metal or fiberglass windows, ventless insulated soffits, fiber concrete facia and trim, enclosed perimeters on all decks. All counties now require sprinkler systems at 80 psi. with a backup tank. Note: Not Allowed anymore under new code: Vinyl windows, wood sidings, wood shingles, open under wood decks, wood trim and exposed wood rafters, vented wood soffits under eaves are not allowed in California Urban Wildfire code. 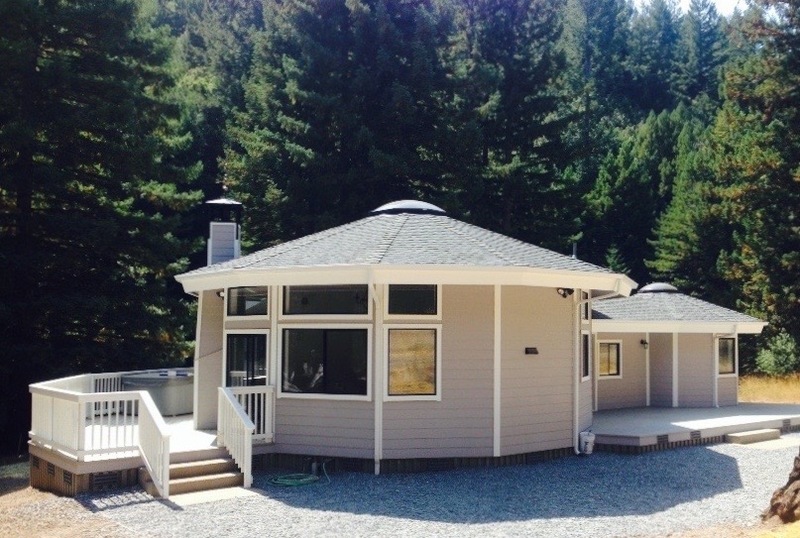 California Yurts as upgraded its product line to meet this new code. Recently after the San Diego fires, we have completed rebuilds and new construction for the Audubon Silverwood retreat as well as in Julian at Camp Stevens. Just Completed also, In Willits California, the John Jeavon’s Ecology Action Biointensive Research and Demonstration Farm yurt cluster. Also just completed the Sonoma Ashram. The yurt that caught on fire inside. When the flames burned the pine boards on the ceiling; first the bubble blew off from the heat then the fire burned the pine ceiling and heated up the fasteners until the paper backing and the fireproof cellulose insulation above, along with the burning pine boards, all fell to the floor and the cellulose on top extinguishes the flames leaving the roof structural framing untouched by the fire. Fireproof Hardi Lap siding and trim with ventless soffits with fireproof Metal tempered windows are all standards on most of our homes. Site applied cement Plaster exteriors can be hand applied in two steps for the longest lasting fireproof siding. We offer pre-colored exteriors with rounded corners. This system has been used in our Baja Yurts for over 10 years now with great durability. Hardi Panel lap or 8” O.C. wood texture panel meets the new Urban wildfire code.